City in Babylonia, situated near Sura (Letter of Sherira Gaon, in Neubauer, "M. J. C." i. 32) on a canal (B. M. 93b). It may be identical with the city of Nahras or Nahar Sar on the Tigris (Ritter, "Erdkunde," x. 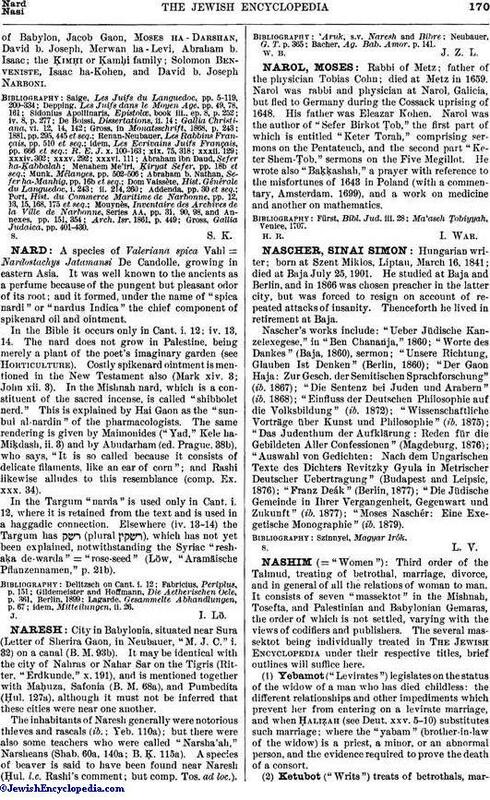 191), and is mentioned together with Maḥuza, Safonia (B. M. 68a), and Pumbedita (Ḥul. 127a), although it must not be inferred that these cities were near one another. The inhabitants of Naresh generally were notorious thieves and rascals (ib. ; Yeb. 110a); but there were also some teachers who were called "Narsha'ah," Narsheans (Shab. 60a, 140a; B. Ḳ. 115a). A species of beaver is said to have been found near Naresh (Ḥul. l.c. Rashi's comment; but comp. Tos. ad loc.). Bacher, Ag. Bab. Amor. p. 141.